Because The Bilingual Zoo has become so active, with the content continuing to grow almost daily, this means that finding specific information can now be a bit tricky. Browsing, of course, is still a fruitful option since it’s possible not only to locate the sort of threads you had in mind, you may also uncover useful information that hadn’t yet occurred to you. At the same time, a targeted search can be made by using the “Search” function on the left side of the menu bar. For instance, if you’re looking for posts related to a certain target language, location in the world, or parenting issue, you need only enter your keyword(s) in the topmost search box and the site will provide a list of posts with the keyword(s) highlighted in yellow. By entering additional search criteria, you can also try limiting the scope of your search further. For more tips on searching the forum, see this “Help” page at the site. Today, though, I thought it might be helpful to compile a curated list of the “top 20” threads, based on the number of posts they’ve generated to date. Although I’ve excluded certain boards or threads in order to focus on content that I think would be of interest more broadly, I encourage you to browse the whole site, if you haven’t before. One board that I didn’t include in this list is Introduce Yourself, which offers a fascinating glimpse into the world’s bilingual families and their challenges. So, without further ado, here are today’s “top 20” threads at The Bilingual Zoo. A wealth of wise, worldwide advice when it comes to speaking the minority language around others. Why is a regular homework routine so vital for advancing the minority language? Are you taking full advantage of this very powerful way of promoting language development? How should a parent go about changing the language used with a partner to bolster the minority language? How can parents nurture their children’s reading ability in the minority language? One mother weighs the pros and cons of her children attending a dual-language school. What if a small child insists on hearing the same books over and over (and over) again? The encouraging story of one mother’s challenges, efforts, and successes. What kinds of games can prompt more speaking in the minority language? What can you do when you experience difficulties in your daily read-aloud routine? How high a priority is your bilingual aim, really? Should this mother be concerned if her son has begun speaking the majority language first? 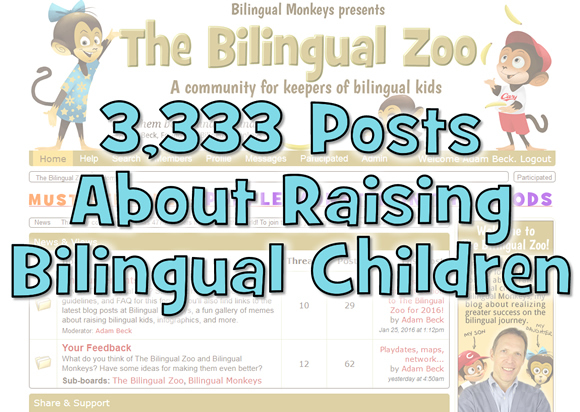 What do parents do to boost minority language exposure on a daily basis? How freely should you engage in outside activities with your child in the majority language? Are there ways to encourage communication in the minority language between siblings? Is it strange, even harmful, if the two parents are speaking different languages to each other in front of the child? How do parents feel about “cultural context” in children’s books and the use of “gore” in traditional tales? How do families handle multiple languages during mealtimes together? What if an older child understands the minority language but isn’t actively speaking it? What can you do to get bilingual children writing more in the minority language? How about you? What do you think of The Bilingual Zoo? Is it helpful to your bilingual aim?